Among other deployments the autonomous underwater vehicle „PAUL“ of the Alfred Wegener Institute is operate to investigate biological and chemical processes in the marginal ice zone. However, due to wind, waves and currents, the position of the ice edge is not stationary, yet it can change its location at velocities close to the walking speed of a pedestrian. Therefore, knowing the ice´s exact drift velocity and direction and knowing about its structure (closed cover, single floes, etc.) are essential preconditions for safe AUV missions along the ice edge and for all kind of scientific analyses. In 2011, during Arctic expedition ARK 26/2, first tests were conducted with a tracking device, which uses GPS to determine its own location and transmits its position via radio communication. This device (“Ice Tracker”) was deployed on the ice by boat or helicopter – methods which turned out to be both time-consuming and expensive. 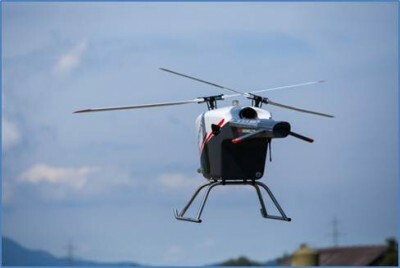 As a consequence, Mr. Sascha Lehmenhecker, a computer scientist at AWI, developed a remotely controlled flying machine (Hexacopter) to simplify deployment procedures. 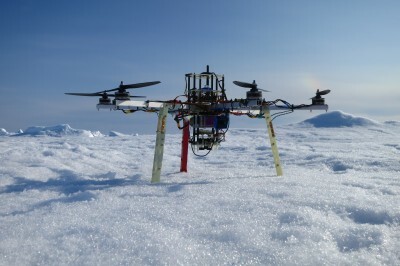 This Hexacopter saw first service during Arctic expedition ARK 27/2 in mid-2012. The Hexacopter landed on the ice and started transmitting its position from there. On RV “Polarstern”, where the AUV´s dive was planned, the signal was received and put on display on the screen of the AUV operator. Thus the Hexacopter undertook a navigational task to support the AUV´s mission planning. In order to provide scientists with an idea of the ice´s structure, satellite images are used to receive a large-scale overview. However, in the specific operation area of PAUL, in the Fram Strait between Svalbard and Greenland, the ice edge features highly dynamic processes – making it necessary to collect high resolution images. So far, these images were collected by manned Helicopters which have conducted survey flights from Polarstern. The Designteam “Unmanned Aerial Vehicle” (UAV) aims at covering both tasks with autonomous flying drones. For this reason, two specific types of drones are intended to be developed: A landing vehicle will conduct an autonomous landing on the ice and will transmit its position for several hours before it flies back to the support vessel. An exploration vehicle capable of conducting long range missions of up to 100 kilometers will be operated to gather extensive information on the ice´s structure. Both vehicles are supposed to find their way back to the support vessel autonomously. The design team consists of the Alfred Wegener Institute as a member of the deep sea science community, the University of Würzburg and the DLR Robotic and Mechatronic Center representing a member of aerospace research. Both types of vehicles are currently under development (as of November 2014). First sensor tests in the Arctic were conducted in summer 2014 and will be continued on Svalbard in winter 2014/15. First deployments of the vehicles are planned for summer 2015 within the framework of Arctic expedition ARK 29/2.2.